Zhu, X., Tang, M., and Chen, H. (2019). "Delignification and hydrolyzation of mycorrhizal black locust biomass pretreated with aqueous ammonia," BioRes. 14(1), 965-976. Arbuscular mycorrhizae (AM) fungi can increase the biomass of host plants that are used as biofuel feedstock. However, little is known about the effects of AM fungi during aqueous ammonia pretreatment of biomass to remove lignin or on the enzymatic hydrolysis of cellulose. The analysis of mycorrhizal colonization (Rhizophagus irregularis or Glomus versiforme) on stems of black locust (Robinia pseudoacacia) plants in their first and second year of growth revealed that the presence of AM fungi and the growth time significantly influenced the lignin and cellulose content of untreated black locust but had no effect on the content of stems pretreated with aqueous ammonia. The presence of AM fungi and/or the growth time also affected the black locust stem structure and the chemical structure of lignin. 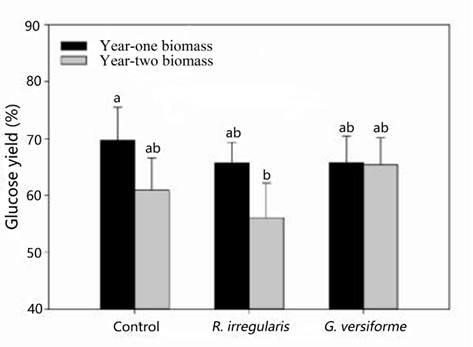 Hydrolysis of mycorrhizal and non-mycorrhizal biomass produced similar glucose yields (except for the second-year R. irregularis biomass, which produced significantly less glucose than the other treatments). The results suggest that mycorrhizal black locust biomass is a suitable substrate for biofuel production. Arbuscular mycorrhizal (AM) fungi can increase the biomass of host plants that are used as biofuel feedstock. However, little is known about the effects of AM fungi during aqueous ammonia pretreatment of biomass to remove lignin or on the enzymatic hydrolysis of cellulose. The analysis of mycorrhizal colonization (Rhizophagus irregularis or Glomus versiforme) on stems of black locust (Robinia pseudoacacia) plants in their first and second year of growth revealed that the presence of AM fungi and the growth time significantly influenced the lignin and cellulose content of untreated black locust but had no effect on the content of stems pretreated with aqueous ammonia. The presence of AM fungi and/or the growth time also affected the black locust stem structure and the chemical structure of lignin. Hydrolysis of mycorrhizal and non-mycorrhizal biomass produced similar glucose yields (except for the second-year R. irregularis biomass, which produced significantly less glucose than the other treatments). The results suggest that mycorrhizal black locust biomass is a suitable substrate for biofuel production. Black locust (Robinia pseudoacacia L.) is a hardy, productive, fast-growing leguminous tree that can be grown in temperate regions worldwide and has the potential to be utilized as a biofuel feedstock (Gasol et al. 2010). Black locust is an important short-rotation forestry crop with many combustion properties similar to other fuels used in power plants (Monedero et al. 2017). Many lectures reported that black locust have higher biomass than those of poplar (Populus) and willow (Salix spp.) (Bongarten et al. 1992; Gruenewald et al. 2007; Grünewald et al. 2009). Black locust as a biofuel feedstock can be directly used as firewood or converted to gas (Geyer and Walawender 1994), oil (Balat 2010) or ethanol (González-García et al. 2011; 2012). Black locust has high glucan/cellulose content, which is a desirable characteristic for cellulosic ethanol production (Torget et al. 1991). To optimize the sugar yields of 1-year-old black locust, Garlock et al. (2012) investigated the use of an ammonia fiber expansion pretreatment and the enzymatic conversion of black locust to soluble sugars. It was reported that the glucan/cellulose content of black locust wood was 37.15% and that the acid-insoluble lignin content was 21.19%. The cellulose and lignin contents of plant cell walls significantly influence the enzymatic hydrolysis of plant biomass to soluble sugars. Cellulose can be hydrolyzed into sugars and then fermented to produce bioethanol. Lignin has a negative effect on the biofuel production process. Increasing the cellulose content or reducing the lignin content or delignification of a biofuel can cause an enhancement in enzymatic hydrolysis efficiency and sugar yield (Alvira et al. 2010). Aqueous ammonia pretreatment is an efficient delignification methodology, which selectively extracts lignin from lignocellulosic biomass at low temperature, and then improves enzyme accessibility to cellulose for enzymatic hydrolysis (Sousa et al. 2016). Genetically modified “energy trees” or genetic mutations to reduce lignin content induce complex responses in plants, and the benefits of such genetic manipulations are still under debate (Zeng et al. 2014). It is well known that soil organisms can influence plant lignin content and that modifications to the lignin biosynthetic pathway can influence soil organisms (Bennett et al. 2015). Arbuscular mycorrhizal (AM) fungi are important soil organisms that can form a symbiotic association with more than 80% of plants, enhancing the plant’s growth and stress resistance (Smith and Read 2008). Liu et al. (2014) investigated the effects of AM fungi on the biomass and bioenergy production of poplar: AM fungi significantly enhanced the biomass and affected the lignin content of poplar. Zhu et al. (2014; 2017) found that AM fungi enhanced the biomass and calorific value of black locust. However, to the authors’ knowledge, little is known about whether AM fungi can influence the cellulose and lignin content of black locust, and whether the pretreatment and hydrolysis steps of the biofuel production process are affected by using biomass that has been colonized by AM fungi. The general objectives of this study were to determine whether the AM fungal species Rhizophagus irregularis and Glomus versiforme have any effect on the cellulose and lignin content of black locust, and whether the aqueous ammonia pretreatment and enzymatic hydrolysis processes are affected when feedstocks colonized with R. irregularis or G. versiforme are used. The plants used in this study were grown on a culture substrate of soil and sand that had been sieved through a 2-mm sieve, mixed (sand/soil, 1:1 v/v), and then autoclaved at 121 °C for 2 h. Each pot (top diameter, 17 cm; depth, 16 cm) was filled with 1.5 kg of culture substrate. Three black locust seeds were sown in each pot. Seedlings were thinned to one seedling per pot after 10 d of germination. The seedlings were inoculated with either AM inocula (R. irregularis or G. versiforme) or without AM (non-mycorrhizal, NM). The R. irregularis and G. versiforme inocula used in this research were provided by the Bank of Glomales in China. The inocula comprised spores (approximately 50 spores/g), hyphae, infected root fragments, and sand. For mycorrhizal treatment, 20 g of the inoculum (either R. irregularis or G. versiforme) was applied to the germinated seeds. For the NM treatment, 20 g of the sterilized inoculum with 10 mL of mycorrhizal fungal-free filtrate meshing (through 1-μm nylon mesh) from the AM fungi inocula was applied next to the germinated seeds. Each treatment included five replicates, and the pots were randomly arranged in the greenhouse. The seedlings were planted in June 2011 and harvested in either October 2011 (year 1) or October 2012 (year 2). The seedlings were cultured under natural light at a temperature ranging between 12 °C and 35 °C and a humidity ranging between 40% and 85% from June to October 2011 or from June 2011 to October 2012. Each pot was supplemented with 100 mL of Hoagland nutrient solution every week and 200 mL of water every three days. The black locust stems and branches were harvested during year one or year two, when they were 5 or 17 months old, respectively. They were dried at 60 °C for 48 h and then milled (approximately 0.25 mm). The cellulose and lignin content were determined using the National Renewable Energy Laboratory (NREL) standard protocols (Sluiter et al. 2010). The samples after Soxhlet extraction were hydrolyzed with 72% sulfuric acid (Luoyang Chemical Reagent Factory, China) for 1 h and then autoclaved after being diluted to 4% sulfuric acid for 1 h at 121 °C. The autoclaved samples were filtered, and the dried residue was weighed to determine the Klason lignin content (Jia et al. 2013). First, Soxhlet extraction was conducted with 95% ethanol (Luoyang Chemical Reagent Factory, China) for 10 h to remove the soluble content (e.g., phenols and flavonoids) of the samples. After Soxhlet extraction, the milled samples (about 4 g) were pretreated at 70 °C for 48 h in a screw-capped 100-mL bottle with a 21% (w/w) aqueous ammonia solution (Luoyang Chemical Reagent Factory, China) and a solid-to-liquid ratio of 1:10. The solid was recovered using a filtration cloth and washed with distilled water until the pH of the filtrate was between 6 and 7. Then, the solid was air-dried and stored at –18 °C (Jia et al. 2013). Enzymatic hydrolysis experiments were conducted using a 5-mL working volume with a loading of 2.0% dry solids after aqueous ammonia pretreatment (w/v) in screw-capped 10-mL tubes. The pH of each sample was adjusted to 5 using a 50-mM sodium citrate buffer. The reaction mixtures were incubated at 50 °C on an orbital shaker at 200 rpm. The commercial enzyme preparations Celluclast 1.5 L® (cellulase, Novo Nordisk A/S, Bagsværd, Denmark) and Novozyme 188® (β-glucosidase, Novo Nordisk A/S, Bagsværd, Denmark) were used for the hydrolysis experiments. The filter paper activity (FPA) of the cellulase was 74.7 filter paper units per milliliter (FPU/mL), according to the standardized IUPAC filter paper assay (Ghose 1987). The β-glucosidase activity was 8451 nkat/mL (~380 IU/mL), which was measured according to the method described by Bailey and Linko (1990). A loading of 15 FPU/g of dry matter of cellulase was used, which was supplemented with 500 nkat/g of dry matter of β-glucosidase and 0.55 mg/mL of xylanase. The enzymatic hydrolysis was stopped at 48 h by boiling the samples for 10 min. After cooling, the samples were centrifuged at 10,000 × g for 10 min, and the glucose content of the supernatants was analyzed using a biological sensing analyzer (SBA-40C, Shanghai, China). Physical changes in the samples and materials after aqueous ammonia pretreatment or hydrolysis were observed by SEM, operated at an accelerating voltage of 10 kV. The samples were air-dried and mounted on aluminum sample stubs. The mounted samples were then placed in a sputter-coating chamber and coated with a thin layer of gold by high-vacuum evaporation magnetron sputtering (208HR, Cressington, England) before examining the samples using a scanning electron microscope (JSM–6360LV, JEOL, Japan). The samples used in the FTIR spectra analysis were pressed into a disc with KBr and analyzed on a Vetex70 (Bruker Corp., Germany). The background spectrum of the diamond window without the sample was subtracted from that of each sample spectrum. In total, 16 scans were collected from each measurement in a wavelength range of 4000 to 400 cm-1. The data of the cellulose and lignin contents, glucose yield (the data for Table 1, Table 2, and Fig. 1) were subjected to a one-way analysis of variance (ANOVA). The means were compared by performing a Duncan’s test at p < 0.05 using SPSS 16.0 (SPSS, Chicago, IL). Before the aqueous ammonia pretreatment, the cellulose and lignin contents of the year-one R. irregularis-colonized black locust plants were 19.9% and 13.4% greater, respectively, than those of the non-mycorrhizal plants (p < 0.05), and the lignin content of the year-two black locust was 11.6% greater than that of the non-mycorrhizal plants (Table 1). The lignin contents of the year-one and year-two G. versiforme-colonized black locust plants were 12.4 % and 7.9% greater, respectively, than those of the non-mycorrhizal plants, but G. versiforme colonization did not significantly (p > 0.05) affect the cellulose content. AM fungi are known to absorb nutrition and exchange the carbohydrate from the host, which influence the photosynthesis efficiency (Miransari 2011; Sheng et al. 2011). In the previous studies, the authors found that AM fungi R. irregularis and G. versiforme enhanced photosynthesis ability of black locust, and increased the carbon content and bioenergy (Zhu et al. 2014, 2017). Liu et al. (2014) reported that AM fungi improved the poplar photosynthesis, cellulose content, and lignin content. AM fungi increase lignin synthesis to enhance the host’s resistance to disease or adverse environments (Zhang et al. 2018). In this study, R. irregularis and G. versiforme had different effects on the lignin and the cellulose content of black locust. 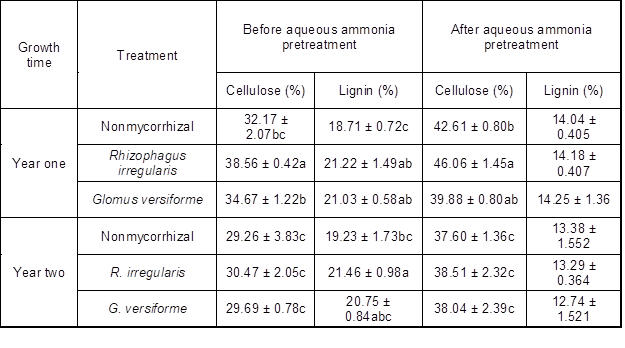 After aqueous ammonia pretreatment, the lignin content of the black locust biomass was significantly lower than that of the untreated biomass (Table 1). The lignin content of year-two black locust colonized by R. irregularis or G. versiforme was approximately 40.0% lower than that of the untreated mycorrhizal black locust, while that of year-one non-mycorrhizal black locust was 25.0% lower than that of the untreated non-mycorrhizal black locust. However, after the aqueous ammonia pretreatment, the lignin content of all the black locust biomass was not significantly (p > 0.05) different, regardless of the treatment. Different letters within each column indicate that the values are significantly different (p < 0.05). AM fungi affect the lignin and cellulose content of the host. Liu et al. (2014) reported that different AM fungi species exhibits various functions on the component contents of poplar. AM fungi could influence the expression of lignin synthesis-related genes in cotton, mediating lignin synthesis (Zhang et al. 2018). In the present study, AM fungi and growth year significantly affected the cellulose content of black locust before and after aqueous ammonia pretreatment. Only AM fungi impacted lignin content before aqueous ammonia pretreatment. Growth year had no effect on lignin content (Table 2). a: *, p = 0.05; **, p = 0.01; and ***, p = 0.001. The highest glucose yields were obtained from year-one non-mycorrhizal black locust, with a conversion rate of 69.7% (Fig. 1). The glucose yield obtained from year-two black locust plants that had formed a mycorrhizal association with R. irregularis was only 56.1%. Glucose yields of approximately 65.0%, which indicate no significant (p > 0.05) difference between the highest glucose yield, were obtained from the plants that received R. irregularis or G. versiforme and the other treatments. Simply reducing the lignin content may not increase the glucose yield (Meng and Ragauskas 2014). Garlock et al. (2012) studied the effect of ammonia fiber expansion pretreatment between 120 and 180 °C and enzymatic hydrolysis of black locust. The studies obtained results showing glucose yields of more than 70% at 180 °C, with high enzyme loading. In this experiment, the glucose yields obtained were almost as high as those reported by Garlock et al. (2012), suggesting that aqueous ammonia pretreatment at 70 °C was a suitable temperature for the pretreatment of black locust biomass in the biofuel production process. Black locust has antibacterial compounds, such as phenols and flavonoids, which reduce the enzymatic activity in the hydrolysis process (Burner et al. 2008). In this study, the soluble content (e.g., phenols and flavonoids) of the samples was removed by Soxhlet extraction to enhance enzymatic activity. In addition to the lignin content, many other factors, such as the sample’s cellulose and hemicellulose content, influence enzymatic hydrolysis (Gourlay et al. 2013; Bals et al. 2014). The degradation of hemicellulose by xylanase promotes cellulose hydrolysis (Hu and Arantes 2011). Qing and Wyman (2011) enhanced the hydrolysis of corn stover by adding xylanase and β-xylosidase, obtaining a glucose yield that was 27% greater than that obtained without the addition of xylanase and β-xylosidase. In the present study, the addition of xylanase did not enhance glucose yield, possibly because the hemicellulose content was so low that it had no adverse impact on hydrolysis. 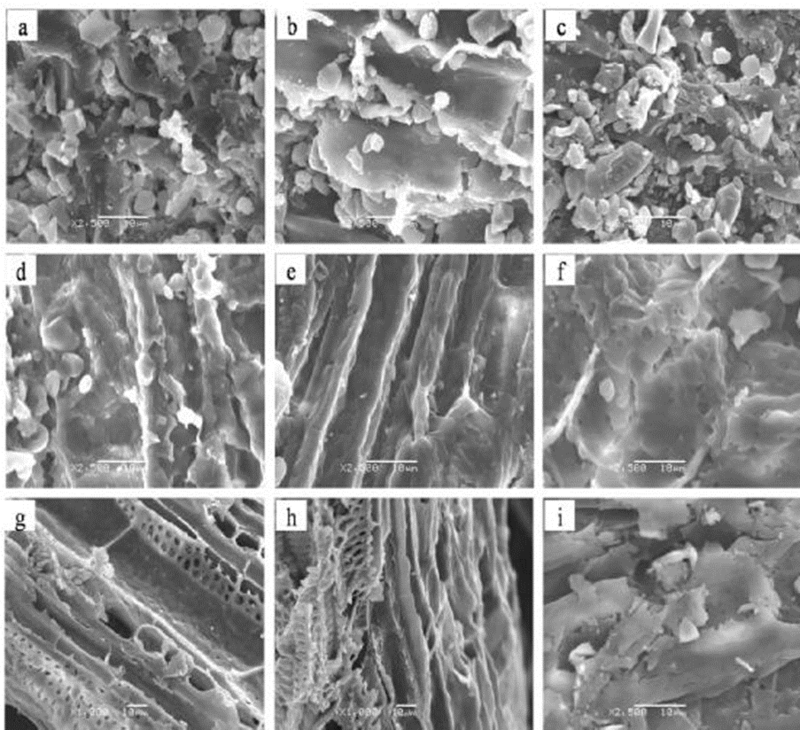 Changes in morphology of the feedstock after pretreatment were observed by SEM. The stem fibers of black locust plants that had formed a mycorrhizal association with R. irregularis (Fig. 2b) were smoother and more compacted and ordered than those of the non-mycorrizal and G. versiforme biomass (Fig. 2a, c), which suggested that AM fungi influenced the structure of black locust. After the aqueous ammonia pretreatment, the surface of the fibers appeared rough, with more micropores (Fig. 2d–f), especially fibers of black locust plants that had formed an association with G. versiforme (Fig. 2f). After enzymatic hydrolysis, its fiber structure broke down because of the loss of cellulose and hemicelluloses (Fig. 2g–i). This destruction by delignification during aqueous ammonia pretreatment, which seemed to increase enzyme accessibility and enzymatic hydrolysis (Cha et al. 2014). Delignification after the aqueous ammonia pretreatment, the stems of black locust colonized by R. irregularis or G. versiforme had nearly the same lignin content as the non-mycorrhizal stems for the enzymatic hydrolysis. 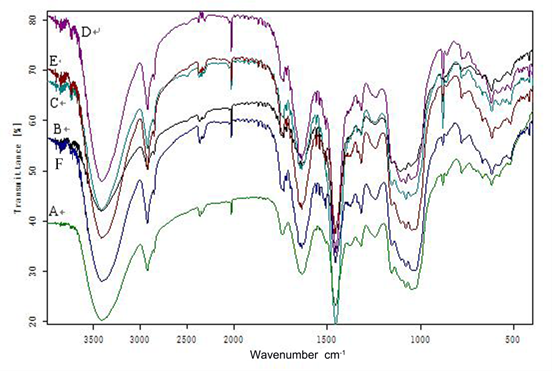 The FTIR spectra (Fig. 3) revealed changes in the chemical structure of the black locust by showing changes in the characteristic adsorption peaks of the chemical functional groups. Lignin is an aromatic polymer with four characteristic peaks at 1600, 1580, 1500, and 1450 cm–1. The alkyl C=O of the lignin side chain linking with an aromatic group has a peak at 1640 cm–1 and absorption bands at 1610 and 1516 cm–1 (Zhao et al. 2008; Gao et al. 2012). Guaiacal rings and syringyl rings are also important functional groups of lignin, with characteristic peaks at 1218, 1268 (C-O of guaiacal ring), and 1315 cm–1 (C-O of syringyl ring) (Hsu et al. 2010). The different intensity bands for all the lignin peaks demonstrated that R. irregularis and G. versiforme had an important influence on the lignin chemical structure. The presence of AM fungi enhanced the lignin and cellulose content of black locust; however, after aqueous ammonia pretreatment, AM fungi had no effect on the lignin and cellulose content. AM fungi affected the structure of black locust stems and the chemical structure of lignin. Apart from the year-two R. irregularis treatment, the glucose yield (%) obtained from mycorrhizal black locust biomass was not significantly different from that obtained from non-mycorrhizal biomass. Mycorrhizal black locust biomass was shown to be a suitable substrate for biofuel production. We acknowledge the financial support of the National Key Research and Development Program of China (2018YFD0600203-3), the National Natural Science Foundation of China (41671268), and the Shaanxi Science and Technology Innovation Project Plan (2016KTCL02-07). Smith, S. E., and Read, D. J. (2008). “Arbuscular mycorrhizas,” in: S. E. Smith and D. J. Read, Mycorrhizal Symbiosis, 3rd Ed., Academic Press, New York, pp. 31-134. Article submitted: April 9, 2018; Peer review completed: July 7, 2018; Revised version received and accepted: November 30, 2018; Published: December 12, 2018.